When you consider how to volunteer abroad on your first…or tenth program with Global Volunteers, think about serving as a couple. You’ll discover much more about each other than in your daily lives. Serving together is a life-changing experience that will both challenge and strengthen you. And it’s a unique adventure you’ll share forever. 1. What countries are on your wish lists? Create separate lists of your top five volunteer abroad locations – including details about what interests you. Then compare your lists. Your selections will likely differ, but Global Volunteers offers a variety of options, so look for overlapping regions. 2. What are your skills? What type of volunteer projects interest you? The type of work you will do depends on (1) what our host communities have requested from us and (2) your interests and skills. Global Volunteers’ unique philosophy of service requires volunteers to work at the invitation and under the direction of local community partners – and one-on-one with local people. While remaining faithful to our philosophy of service, we will also do our best to tailor to your preferences as a couple. 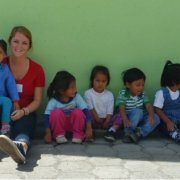 Global Volunteers offers various volunteer projects ranging from Teaching to Childcare, Labor to Gardening. Start by downloading the Global Volunteers e-catalog here. Or, call 800-487-1074 for a mailed copy. Our catalog describes the service projects in greater detail, and how to volunteer abroad in each country. 3. What level of comfort do you prefer as a couple? Depending on your appetite for challenge and adventure, you can choose a program close to home, or in a community remote and unseen by conventional tourists. And, lodging in our partner communities also ranges from dormitory style in the USA to comfortable hotels and guest houses in small towns or large cities abroad. Each has its unique appeal; it just depends what your preferences are as a couple! We find that many couples prefer a private hotel room. Global Volunteers offers private room options in: China, Cook Islands, Cuba, Ecuador, Greece, Italy, Mexico, Peru, Poland, Portugal, Romania, St. Lucia, Tanzania and Vietnam. In West Virginia and Montana, your roomy home provides a frame or bunk bed. Private rooms can sometimes be arranged in the USA depending on the volunteer team size. Learn from alumni couples about how to volunteer abroad. Alumni Global Volunteers couples can offer advice on how to volunteer abroad together. Read testimonials here or call us at (800) 487-1074 for references from the countries of your choosing. You can register online here. Where will this journey take you? Perhaps volunteering as a family is your next adventure in service! Take the next step! Request more information. Either They're Getting Taller, or I'm Getting Shorter!